Charming, but extremely boring. The Sundance version of Disney's live-action films. Made for fans of caffeine and adults desperate to get their kids to something, anything, before summer ends. A.A. Milne and Ernest Shepard’s Winnie-the-Pooh is almost 100 years old — he’s 92 — and has been a beloved Disney character for 52 years. Just giving a little perspective to show they’ve had plenty of time to develop a worthy live-action version of our favorite Hundred Acre Wood characters. Christopher Robin is not it. And to think it took five people to mess it up. Two (Greg Brooker and Mark Steven Johnson) to come up with a story and three screenwriters (Alex Ross Perry, Tom McCarthy, and Allison Schroeder) to write the cliched screenplay. If it weren’t for Ewan McGregor as the titular character, and our favorite Pooh characters in supporting roles, the film would be a complete wash.
Young Christopher Robin (Orton O’Brien) is off to boarding school and saying farewell to his childhood friends. Winnie the Pooh (voiced by Jim Cummings), Eeyore (voiced Brad Garrett), Kanga (voiced by Sophie Okonedo), Roo (voiced by Sara Sheen), Rabbit (voiced by Peter Capaldi), Piglet (voiced by Nick Mohammed), Owl (voiced by Toby Jones), and Tigger (Cummings) are all in attendance. A quick montage shows him dealing with the passing of his father, serving his country in WWII, a crumbling marriage to Evelyn (Hayley Atwell), a job he hates, and becoming estranged from his daughter Madeline (Bronte Carmichael). But soon enough, the Hundred Acre Wood comes calling and he’s forced to realize that he needs to get his priorities in check. The biggest issue with Christopher Robin is that we know exactly how it’s going to end right from the start. The least the screenwriters, or director Marc Forster could have done was come up with some ways to tug at our heartstrings. The marketing department sure has, but the film is completely mismarketed. 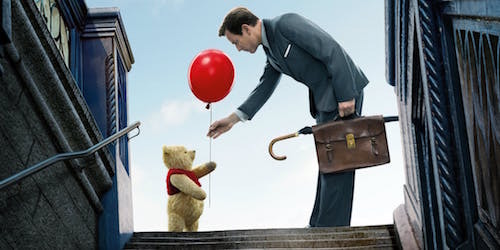 The trailer and TV spots are trying to convince audiences they’re in for a bouncing good time, but in reality, Christopher Robin is your standard midlife crisis drama that happens to have Milne’s beloved characters in it. They take the backseat to McGregor stuck in A Wonderful Life story where he has to decide what’s more important: Working all weekend or putting his family first. Yeah, we’ve seen this before. Don’t get me wrong, Christopher Robin is never terrible, just don’t go in expecting it to be another Disney adventure. Even kids will become bored fast — especially in a summer crowded with far better family fare with way more energy. Unfortunately, Christopher Robin is just another misstep in a long line of live-action attempts. (See Alice in Wonderland/Through the Looking Glass, Maleficent, Cinderella, and Beauty and the Beast.) They can’t all be The Jungle Book, but that won’t stop Disney from pumping them out ad nauseam. Christopher Robin won’t last long in theaters and will get swept under the rug. If you need to take your kids on an adventure with Pooh, you’re better off staying home and catching up on the original Many Adventures of Winnie the Pooh or the underrated/underseen Winnie the Pooh from 2011.